There is something special about the Space Shuttles that didn't exist when every rocket and capsule were built as disposable spacecraft. Just like we get attached to our cars (OK, maybe it's just me), we got attached to these vehicles that at least in the 1980s and 1990s symbolized a revamped pursuit of space and getting one step closer to space travel as we'd really like to experience it (whenever, wherever - à la Star Trek with some extrapolation). Every Space Shuttle launch causes a special buzz among space enthusiasts, who in recent years have had online venues for their thoughts and experiences. Blog posts are written, pictures are uploaded (also here) and the social network is flooded with copious amounts of updates. NASA itself joined the party in several ways - allowing the public to vote for astronaut wake-up songs, the opportunity to upload one's face to space and NASA Tweetups like the one I attended last May, where 150 lucky people become journalists of the best kind - supportive and enthusiastic, almost NASA ambassadors to the world, all posting to Twitter using the #NASATweetup tag. 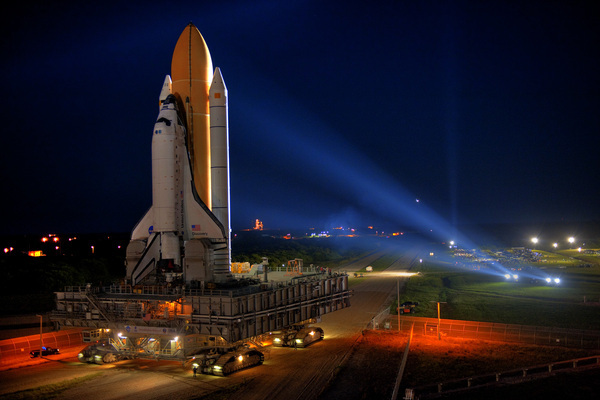 STS-133 and Space Shuttle Discovery are no different. In fact, since after this launch there will be only one more (maybe two) Space Shuttle launches before the program reaches its planned shutdown, the normal jitter and excitement seems to be even greater. The NASA Tweetup event even got its own blog created by Nathan Bergey. This last flight of Discovery will also bring a new dweller to the ISS, one that doesn't consume oxygen or water - Robonaut2, the first first dexterous humanoid robot in space, aimed at providing another pair of hands for repetitive and maintenance tasks that would otherwise require people, without making changes to the original component, for example an air filter. Since you're reading these lines it would be almost moot to ask if you know when Discovery is being launched and you obviously know the name of the Space Shuttle being launched. What I'm wondering about is how much of that is known to your friends and family, that might not share the same enthusiasm for space. Please report back by commenting on this post (no need for names, just people's answers). Update: Commenting disallowed, as Discovery successfully launched on February 24 2011. Thank you everyone who participated! Have NASA and the space enthusiast community been successful at keeping space exploration on people's minds in such a critical era of economic woes and budgetary battles? 1. Discovery, ?, ?, ? 2. October 23, ?, ?, ? 4. ?, ?, ?, ? I asked my wife, and she can't answer any of the questions. Only the most die-hard of space cadets would be able to answer all four of these questions correctly. What made you choose these particular questions? There are too many space technologies and projects being worked on to count. This is the here and now - Discovery getting ready to launch for the last time and one of the last launches of any Space Shuttle, practically the end of an era. Knowing all questions is a lot, I agree, but I wanted to see if at least 1 or 2 questions would get an answer, meaning that these current space events are to some extent on people's minds. When I knew him he was an Medic. Found out he now works for Goodyear Aerospace. I'll try again with a someone else. LOL - I'd ask my wife, but she has no clue! LOL Her blanket answer to space stuff - "I'll just smile and nod"
I knew there will be a shuttle launch soon. that is all.